This summer my family decided to take our summer vacation where the sun shines 24 hours a day!! We went to Iceland. The country of Iceland offers breathtaking landscapes, glaciers, waterfalls, hot springs, all nestled within the Viking heritage. Although it sounds far off, it was actually only about 5 hours by plane from New York City. It was perhaps one of the most amazing and diverse trips I have ever experienced. Today we walked around the capitol city of Iceland. 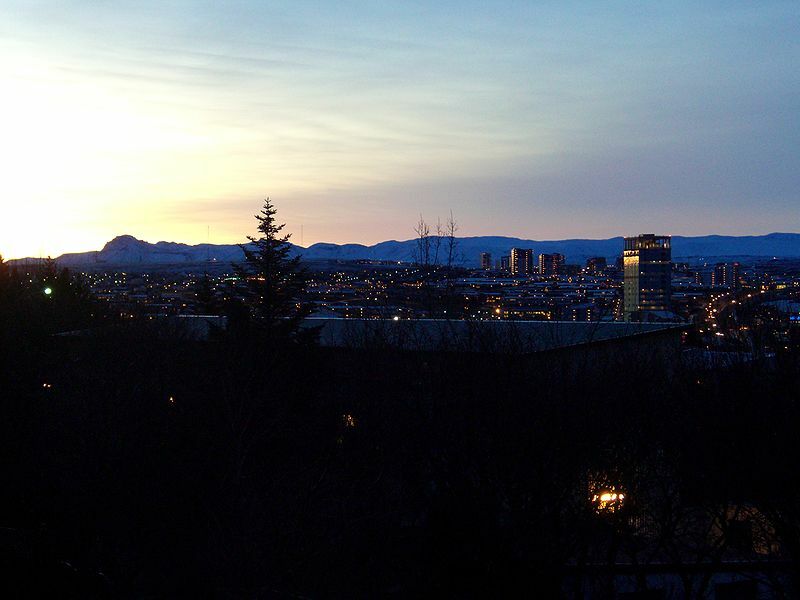 Reykjavic is a wonderful European city filled with lots of history, shopping and delicious restaurants. There are ruins dating back to the Viking Era down Reykjavic’s oldest main downtown streets. The weather was around 60 degrees F. We ate hot croissants as we walked around the city. One famous monument of Reykjavic is the enormous church built in the city center. 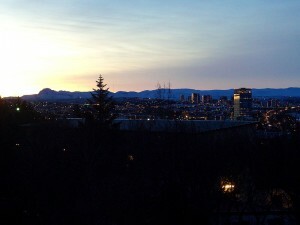 The church is called Hallgrimskirkja and offers a view of the city that is stunning. In front of the church is a statute of Leifur heppni (the Lucky), an Icelandic/Norwegian explorer who was the first European to set foot in North America according to the Icelandic Sagas. We loaded onto the bus for the Golden Circle tour where we went through the famous Thingvellir National Park which was very beautiful, then on to Gullfoss (Golden Waterfall) in the highlands and the Geysirs. The highlight of this tour for me was our trip to the Geysir. There were several active geysers that we were able to stand right near. The larger Geysir went off every ten minutes and it was a sight to see. The hot water sprayed straight up and you could feel the heat. It was such a thrill. The miracles of nature were abundant on our tour. We even witnessed them at work in different ways as we toured a geothermal power plant which is responsible for heating all homes in Iceland. 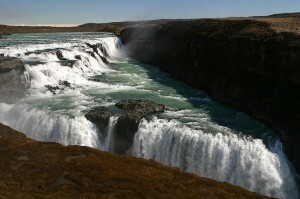 Geothermal water is one of Iceland’s greatest resources. Not only is it used to heat houses and produce electricity but it is also wonderful to just sit in it. Iceland has over 170 geothermal pools that are open all year round. Today we rode Icelandic horses. The Vikings arrived in Iceland more than 1000 years ago, bringing with them their small Nordic horses. Today, because of isolation, the breed of this horse remains pure. They are small, gentle, and friendly. Icelandic horses are quite a bit smaller than the horses I have ridden in Montana. Icelandic horses also differ than other horses because they actually have 5 gaits. The most popular gait is the “tolt”. This is a four beat gait with light flowing movement that is comfortable to ride. The other gaits are walk, trot, gallop and flying pace. The horses come in a variety of different colors or color combinations. The color palette is so wide that any color found in horses around the world can also be found in the Icelandic horse. In the summer, the horses are set free to graze and feed. In the winter months the horses are rounded up and cared for in stables. I found the Icelandic horses to be very hardy, sure -footed horses and I thoroughly enjoyed having the opportunity to ride one. Seeing the Icelandic landscape on horseback was delightful. We crossed running streams, rocky tundra, lush mossy meadows and fields of rough lava. Today was an adventure into the Blue Lagoon, literally!! We went to the Blue Lagoon which is a thermal pool which is said to have many healing energies. The water is thought to aid skin ailments like psoriasis and eczema. Visiting a geothermal pool is essential while staying in Iceland. After the Blue Lagoon we returned to Reykjavic. We shopped around for a few souvenirs and wandered into some local art museums. We walked over to the National Gallery of Iceland and the Culture House. The Culture House has the Eddas and Sagas, the medieval manuscripts from their earliest days. The poetry and prose preserved are evidence of man during the Viking Age. I adore poetry so this was of particular interest to me. Lastly, we walked on down to the Old Harbour to eat fresh seafood. We had an amazing day driving around in a monster truck down the southern coast of Iceland where the beaches are black sand (ash from the volcanoes). We went 4 x 4 wheeling through the sand dunes which was fun and scary at the same time. We went over to see several waterfalls which were spectacular. We were even able to walk behind one of the waterfalls which was thrilling and not to mention wet. It is rare to be able to reach out and touch a waterfall in nature. The water was icy cold, naturally from the glacier. Today was surreal as we drove over to the most recent volcano eruption – E 15 as the media referred to it (given the fifteen letters that follow the “E” of Eyjafjallajökull). The landscape there looked like something you might see on the moon!! Everything was covered with ash; even the glacier had a black appearance. The devastation to the environment was very apparent as the once green, lush, mossy land was nothing but black and ashy. Where there was once a 50 foot deep lagoon lays only volcanic ash. Needless to say, it was a very exciting day. Exhausted and a little worn out from all the excitement of this wonderful country, we took our last walk around town and down to the Harbour. We stopped and purchased our last round of souvenirs then took a taxi to the airport. Good bye for now, Iceland. I am really looking forward to our return. Beat together eggs, milk and vanilla. Mix the dry ingredients. Add them to the egg mixture and blend thoroughly. Keep in a fridge for 1 hour. Melt margarine and whisk with the dough. Keep the pancake pan fairly hot, pour on the batter. Roll about to cover the pan and make the pancake thin. Bake for a moment, then turn it over and bake the other side for a short while. Transfer to a plate. Sprinkle with sugar or serve with jam and whipped cream. Delicious!!! !